Catherine Brinkley is a professor of human and community development and human ecology at UC Davis. So it's interesting that in a recent published paper, she advocates that cities should work more like coral reefs — supporting a diversity of niches and uses for sustained vigor and resilience. 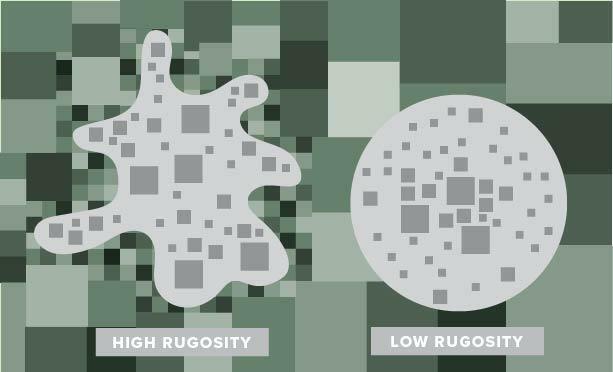 In ecology and medical sciences, the term for a physical form with such topographic complexity is rugosity. Traditional urban planning favors "concentric" layouts with a downtown core surrounded by suburbs and farmland (right). But Catherine Brinkley argues instead that cities should plan for "rugosity" (left) with more interfaces between functions. Brinkley challenges that status quo in her article — "High rugosity cities: The geographic, economic and regulator pathology of America's most non-concentric urban areas." The article was published in Land Use Policy this winter. "Higher urban rugosity can be achieved by maximizing the urban interface through implementation of greenbelts, green wedges, and wildlife habitat corridors," she said in the article. The only commonality among the top 30 high-rugosity counties she identified–since they had dissimilar county, state or local planning governance structures — is that they were under extreme pressure to both develop housing and have abundant productive farmland. Nearly a third of the counties in the top 30 had experienced high population growth in recent years. Visalia, in Tulare County, California, has achieved one of the most non-concentric urban areas in the U.S., even though the Visalia General Plan calls for the county to "manage planning area growth to be contiguous and concentric from the city's core area." "Developers are now building housing around farmlands the way we used to build around golf courses," she said. Farms closer to cities generate more profit per acre because they have greater opportunities for direct marketing sales to their neighbors, she added. Brinkley sees her research as extending the concept of "mixed-use" development from the neighborhood to a regional scale. There is also evidence that interweaving urban use and farmlands could help decrease the urban heat island effect and improve stormwater runoff management, Brinkley said. A heat island refers to a metropolitan area that is significantly warmer than its surrounding rural areas due to human activities and lack of vegetation. "In sum," she says in her article, "these findings push the boundaries of modern planning to reconsider the periphery as important in shaping total landscape development."